By popular demand we are offering another chance to work with Jane Wilkinson and learn the basics of basketry. 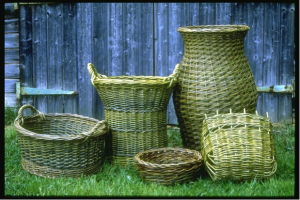 This two day course will give you a thorough grounding in the skills and techniques required to make a round willow basket. Each participant will tackle their own individual project after a brief discussion of the possibilities. You will also be able to include found objects, such as deer antlers, shells, winter foliage and hedgerow materials if you wish to create a more sculptural piece. Or you may wish to concentrate on a utilitarian project such as a willow shopper or small log basket. The choice is yours. This class is a good follow on from the Woven Fruit Bowl class, the Festive Willow Crafts class or as a standalone option for those new to the craft.